He is one of the NFL's all-time great quarterbacks. A walking record book, Peyton Manning led the Colts to a pair of Super Bowl appearances, including a victory in 2006. Since moving to the Denver Broncos, Manning hasn't let up, continuing to perform as one of football's premier stars and also adding another title. As one of the most visible faces in the NFL, Peyton Manning rookie cards are quite popular in the hobby. Despite all this, many of the early Peyton Manning cards remain relatively affordable. Coming out at the end of a hobby era, just one is autographed and only a few come with serial numbers. There are some notable exceptions, which do command a premium. However, most Peyton Manning rookie cards can still be found for relatively low amounts, especially considering his impressive résumé. Shop for Peyton Manning rookie cards on eBay. Collectors have more than 40 Peyton Manning rookie cards to choose from. So even with the largely reasonable prices, assembling a complete collection is a challenge. While most of the official rookie cards are not terrible on the wallet, collectors looking for rarer inserts and parallels have even more to choose from. 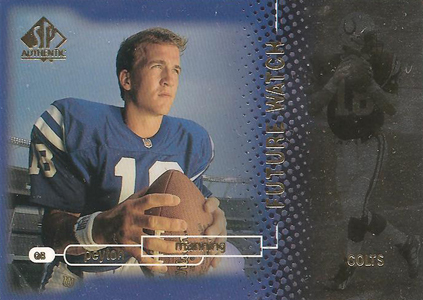 In 1998 —Manning's rookie year — the hobby was focusing largely on inserts and a growing number of parallels. While autographs and memorabilia cards were a rising part of the hobby, they were still largely on the outside. Obviously, this is no longer the case and there are plenty of signed Peyton Manning cards to chase. Below is a list of the top Peyton Manning rookie cards. While market value was the primary criteria, brand recognition and a set's popularity also came into play. Forget a 5-Hour Energy or that sixth cup of coffee. 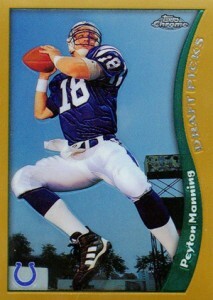 If you're trying to stay away, just pull out the 1998 Pacific Revolution Peyton Manning rookie card. Sparkly foil and abundant swirls make it one of the loudest designs to hit the hobby and even more appealing for those who remember his college days fondly. 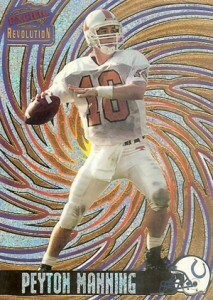 Clear acetate and rainbow foil collide with another one of Peyton Manning's most distinct rookie cards. The practice uniform hurts some of the overall look of the card, but the different card stock and blended styles work in the end. The Finest brand is one of the most storied in the modern hobby. Famous for its foil look and Refractor parallels, it has been popular since its debut with 1993 Topps Finest Baseball. 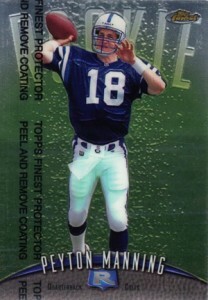 The 1998 Topps Finest Peyton Manning has a clean photo but a fairly plain design. Cards originally came with a clear plastic cover designed to protect the card's surface. Collectors have the option of taking it off. There's no stopping Chrome. Although not as popular with football collectors as it is in baseball, the Bowman Chrome name still carries some punch. 1998 Bowman Chrome Football marked the first time the brand took to the gridiron. The design is very similar to the baseball release from the same year. And while the 1998 Bowman Chrome Peyton Manning is popular, the Refractor parallel is in much more demand. 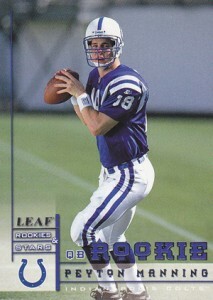 Perhaps the cleanest of all Peyton Manning's rookies, the 1998 Leaf Rookies & Stars card is a short print. However, it's not terribly rare. It does command a bit of a premium over most of his firs-year cards, but not by a huge amount. 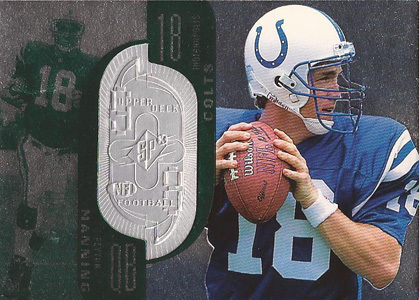 A very stylized portrait, the 1998 Upper Deck Peyton Manning is easy to pick out. Part of the Star Rookie subset, it is also a short print. Combine that with the overall popularity of the flagship Upper Deck brand and you've got one of the quarterback's most iconic cards. 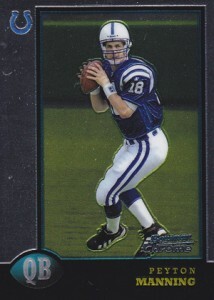 With a flashy photo and wavy design, the 1998 Topps Chrome Peyton Manning rookie card shows a lot of energy (but not the chaotic energy shown on his Pacific Revolution rookie). The blue sky cast against the in-motion QB comes close to being a truly noteworthy card. If only a little more connection was made with his face. The big draw of the 1998 SPx Finite Peyton Manning is its limited print run. While the ornate foil design certainly helps it stand out, as far as numbering goes, it's technically Manning's rarest official rookie. 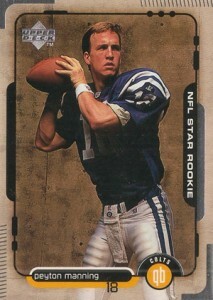 Without a doubt, the 1998 SP Authentic Peyton Manning is among the quarterback's best rookie cards. A hugely popular brand, a great photo and a serial-numbered print run combine to make one of the best rookies of the 1990s. Although most of his rookies can be found for reasonable amounts, the 1998 SP Authentic is measured in the mid-to-high hundreds and professionally graded cards can easily go into the thousands. Boasting an on-card signature and a stated print run of just 200 copies, this card sets the benchmark for all Peyton Manning cards. In fact, it's an all-time classic in the hobby. This iconic card is a tough find and they're extremely pricey when they do show up. 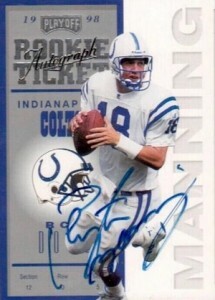 Beyond the signed card, there are actually a few different Manning cards to be found in 1998 Playoff Contenders. Thanks Ryan for the article. My personal favorite is the Fleer Ultra #201 Manning RC. Fleer gave us a monkey wrench with a 1:3 ratio of rookie cards making this one a tough pull. 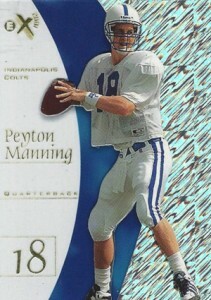 This was one of the first Manning cards to be released. Also I remember folks speculating on the Ryan Leaf in the set too as valuable…well we know what happened there. Jeremy � The Leaf/Manning debate came up many time in conversations I had at the start of this season as we pondered similar situations with Luck, RG3 and company. That’s turned out a little differently so far. Can you help me identify a peyton rookie card? I think it’s the 98 collectors edge draft day with a piece of jersey that’s a refractor. Any help would be great!